Fiberglass was first introduced in 1995 by Owens Corning, and the material — as well as countless others like it — have advanced significantly since its initial inception. That being said, many businesses rely on durable and sustainable materials to help accomplish landscaping projects efficiently and professionally. It’s not uncommon to experience problems when working on landscaping projects, and recycled plastic lumber and other sustainable materials can help. Here are just a few common issues that recycled plastic lumber can solve. Landscaping requires a wide variety of materials, and while it may seem logical to assume they’re all sustainable, it’s unfortunately not true. In fact, many people use traditional, everyday plastic when crafting their landscaping projects. But we know by now that this is not at all good or beneficial to the environment. Using recycled plastic lumber and other sustainable yet durable materials provides the same long-term results without the environmental stress requires to manufacture traditional materials. It’s always best to be environmentally responsible and make the sustainable choice. Lack of durability in landscaping materials often leads to sloppy results that just don’t last. Instead of having to readjust and re-evaluate the state of your landscaping project every other week, invest in the right materials needed to keep it in place from the get-go. This is especially true when it comes to fencing. Whether you’re working with landscaping fences or playground fences, weak materials lead to low-quality results. Invest in the project’s longevity through sustainable and durable materials. Finally, many traditional fence materials can come with higher charges, but recycled materials are almost always more affordable. 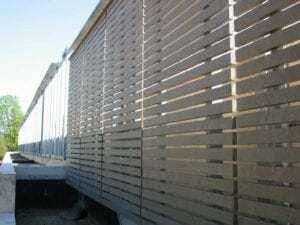 Fencing systems for both landscaping projects and playgrounds come in countless varieties, types, and sizes, and you may be surprised at how much you can save by investing in the right materials. Ultimately, there are plenty of sustainable materials to choose from when working on commercial landscaping and construction projects. These may not be the only problems your business has to solve with landscaping project or playground construction, but using the right sustainable materials can almost always provide a leg up. For more information about recycled plastic lumber for playground equipment, contact Bedford Technology.